Teens, Writing and Randomness: Cover Reveal! I paint with a light brush when describing what my characters look like. I try instead, especially through dialogue, to convey who they are. In terms of physical description, I only give readers a few specifics, and leave the rest to their imaginations as the story unfolds. 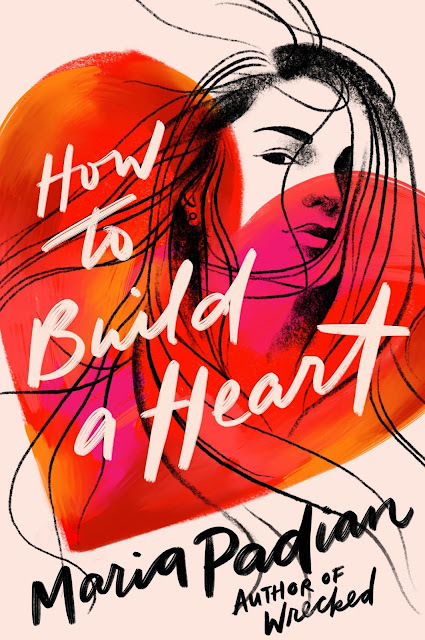 So I was fairly gobsmacked when my editor shared artist/designer Connie Gabbert's cover depiction of Izzy, who is the main character and narrates How to Build a Heart. "Oh my god. It's her!" I exclaimed. Out loud, to the empty room, as I stared at my computer screen. Well, maybe Frisbee (The Dog) was there. But probs not. I talk to myself. A lot. I'd like to tell you it's an occupational hazard (Writer Who Spends Too Much Time Alone) but I've been doing it for years. I. Love. This. Cover. The expression on the girl's face completely conveys what Izzy feels most of the time. That will change as the plot unfolds, but for most of the book ... that's her. Intrigued? Head over to Bustle for the first chapter! And if you want more, mark it as a To Read on Goodreads! How to Build a Heart is a Fall 2019 book, with an on sale date of January 2020.